.Communication servers used for business should provide solutions to current real world business requirements such as: simplifying and improving communications, lowering costs, improving productivity, supporting SOHOs and diversifying of the workplace. They should do all of these while flexibly adapting to the way each organisation works. The KX-NS1000 Business Communications Server by Panasonic is designed to deliver these solutions by integrating hardware and software components in a modular way, allowing you to tailor a communications system to your specific needs. The system functions can easily be expanded by adding software applications and licences, enabling the system to meet the requirements of any company — no matter how large or small. Furthermore, users of an existing Panasonic legacy PBX can easily migrate to an IP system by connecting a KX-NS1000. Legacy systems can also be expanded to perform partial migration according to the available budget. 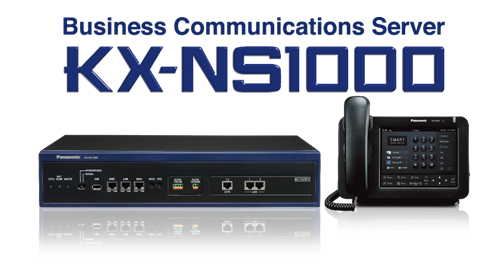 You can easily integrate your system with the KX-NS1000, depending on your specific needs or budget, because the KX-NS1000 is suitable for all kinds of businesses or industries, such as sales, customer service, hospitality, healthcare, and home teleworkers.